Softball coach Sammy Fernandez makes it a point for her players to have their cell phones off during games — other than the one phone that blasts each player’s walk-up song through the speaker in the dugout. Sam Riccardulli is an exception. 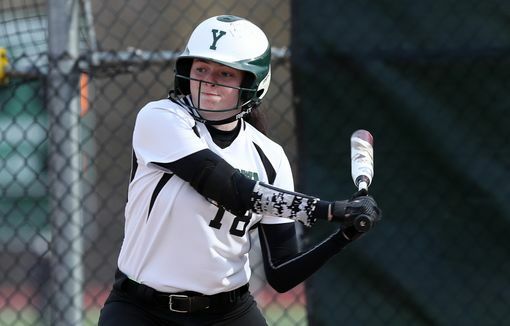 Yorktown's senior center fielder was diagnosed with type 1 diabetes (T1D) in February 2017, and her blood sugar is monitored on her phone through the Dexcom application on her continuous glucose monitor (CGM). Her father, Bill, is often just beyond the fence in the outfield and has the same app on his phone as the second line of defense. When the pump that provides Sam with her regular insulin failed during a game against Lourdes on Monday, she was notified right away. Her coach subbed her out for an inning so that she could change her pump, then put her back in the game. Sam was taken to the doctor two years ago after her mother started noticing she was displaying some of the symptoms associated T1D, such as unintended weight loss, increased thirst and frequent urination. She lost 25 pounds in about six weeks and was drinking 12-15 water bottles each day. T1D although once known as juvenile diabetes, affects approximately 1.25 million Americans of all ages, shapes and sizes, according to the American Diabetes Association. TID makes up roughly five percent of all people with diabetes. Life is different for Sam from the moment she wakes up. As a junior, Sam was named to the all-star team after hitting .472 with a team-high 27 hits and zero errors committed in the field. She was selected to the "Next Nine" preseason watch list this year, which recognizes the top 18 returning players from Westchester, Rockland and Putnam Counties. It did not take long for Sam to make an impression on her new head coach. Yorktown is regularly one of the rowdiest and most animated dugouts in Section 1 softball. Whether it’s waving flags, scaling the fences while cheering on the team, or singing along to a hip-hop song, the Huskers are never short on team spirit. Sam said part of what makes a strong leader is being someone teammates can come to and trust about various issues.